Are you ready to unleash all of those spells on the helpless peasants in your neighborhood? Make sure you have the perfect outfit for your night on the town with this Darling Spellcaster Costume. 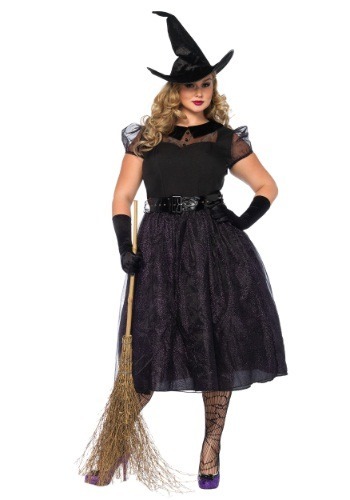 With this elegant, yet classic witch look, you'll look nice enough to pass as an ordinary citizen. Although, when you bust out that cauldron and start boiling up some toil with a hint of trouble... well, no one's really going to be all that surprised. This costume relies on the traditionally haunting style of a witch but makes the perfect fashion upgrades in all the right areas. A sheer organza yoke is topped with buttons and a velvet collar and when combined with puffy cap sleeves, it makes a stunning contrast to the black bodice. A shimmering mesh skirt overlays the dress skirt, and with purple glitter accents that really stand out, everyone's going to know that you're a spellcaster with some serious mojo. Finish this enchanting ensemble with the included wire brim hat and patent leather belt, then add your favorite witchy accessories for a look that really pops. Get yourself this luxe witch look for this Halloween season, and we think you're going to have a ton of fun whether you've got your spellbook in hand, or if you leave it safely at home. We promise not to let the village residents know that you're on the way. We wouldn't want to ruin the magical surprise you have in store for everyone this year!